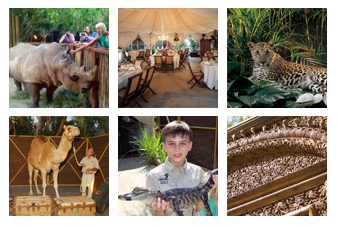 Authentic and unique entertainment options are an integral part of the NGALA® experience. Their specialty instruments, exciting personalities, and pride in their work make them masters of their crafts! 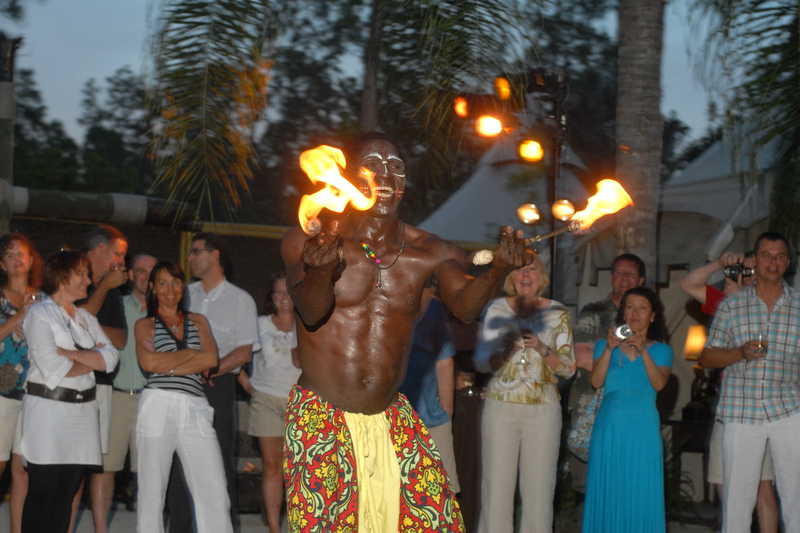 They range from living orchids, to masterful musicians, cigar rollers, and master story tellers. Many of these performers represent various destinations from around the World. 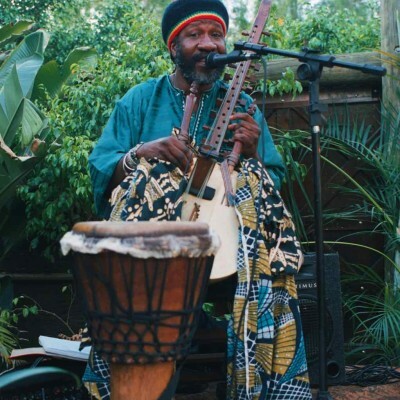 Only at NGALA® can one enjoy the live and enchanting African sounds of “Master Musician”, Ajamu Mutima. The live performance of “Kora Nights” melds a wonderful mix of the African Kora (an antiquated African banjo of sorts with a multitude of strings), wooden flutes, and hand crafted drums all, intertwined with the deep resonate voice of a Traditional Griot storyteller. Guests and musicians a like marvel at the multitude of dynamic talent wrapped up in this one individual. Ajamu and NGALA share the heart beat of Africa with influences from Afro-Cuban and Calypso tunes to inspired songs, including bluegrass and soothing soft rock sounds. With his expression and sincere verbal interaction, Ajamu truly connects with our guest! From his arrival to his departure Ajamu take us on a musical journey! Ajamu intimately shares his soul and communicates with his lyrics and different instruments. A wonderfully refreshing talent, Ajamu is a “must have” at NGALA®. Ajamu Mutima is available to present his authentic sounds from the beginning of your event, taking only a subtle break during announcements. His CD “Kora Nights – Returning”, created exclusively for NGALA is available as a wonderful turn-down gift and departing touch. 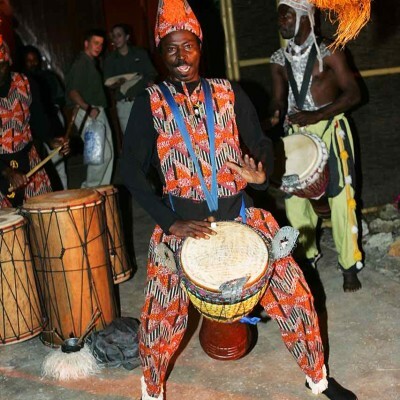 Experience the power of the drums and the syncopated footwork of Kobake at NGALA®. 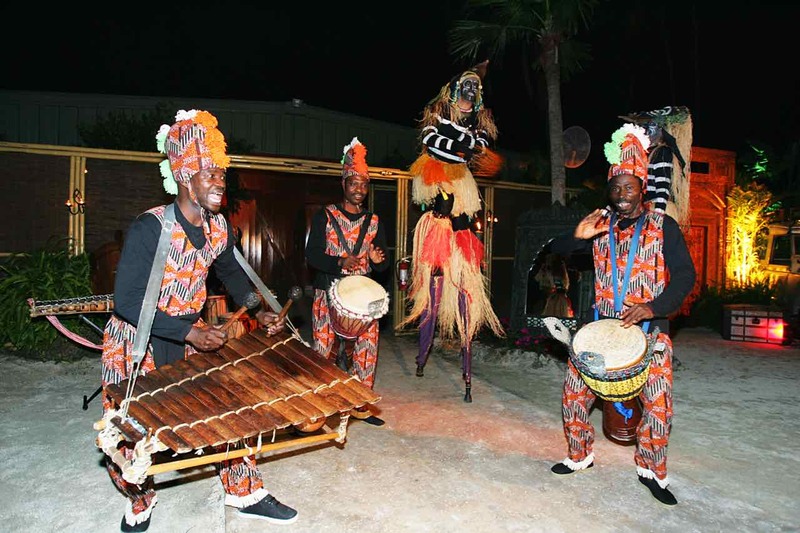 The Kobake African Drummers are authentic West African representation with authentic hand-carved drums and colorful costumes and accessories. This is a fully-choreographed and rehearsed performance which will include ancient rhythms, dances and songs from Senegal, Guinea, Conakry, and Cote’D Ivoire, West Africa. These world-renowned artists celebrate unique West African dance styles including Zouli and Boloh, from Senegal, Cote D’Ivoire and Guinea, to the beat of live ethnic drums. Kobake can feature up to seven performers, five drummer/dancers and one of these is a fire eater, plus two Gueglin (stilt walkers). This is an excellent very high-energy show with audience participation. Performers travel from around the world to bring you this truly unique performance. 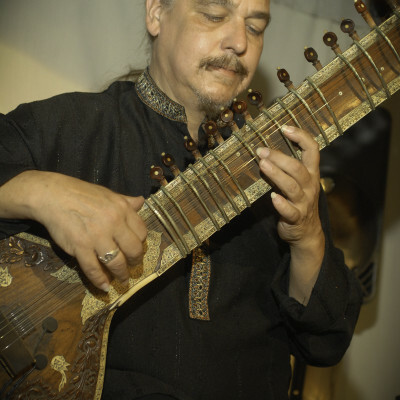 NGALA’s® Master Sitarist, Stephan Mikes, extends the unique opportunity for modern listeners to experience ancient world music at its best! This intriguing instrument with its’ distinct, yet unobtrusive sound is ideal for receptions and/or dining. In addition to enjoying the resonating rhythm of the sitar, a live sitar performance simply amazes guests. Even experienced musicians will greatly appreciate the rich culture behind the sitar and will acknowledge the dedication required to master the challenges of pulling and bending its’ strings to achieve a “Meend” – which is the opposite technique used to play a blues guitar. Unlike other instruments, even after years of practice and performance the sitar is extremely difficult to play. After dedicating years to playing the sitar the musician’s fingers still endure great pain to achieve the various renderings and notes the instrument is capable of delivering. Sitarist, Stephan Mikes, is also available to present his authentic sounds during the event, taking only a subtle break during announcements. Nova Era is an impressive kaleidoscope of talent, music and magnificent costuming. A careful painterly cinematic composition, this film places its viewers in the position of visitors to an art gallery. 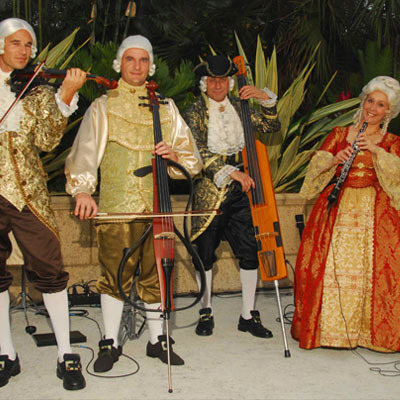 Nova Era performs in handcrafted 18th century costumes, and ornate, powdered wigs. This beautiful touch lends an authenticity which lifts the music to a higher level. At first glance, you might think you are attending an 18th century concert — that is, until you see the electric instruments, taking a giant leap into the 21st century. This visual combination of old and new perfectly reflects the music of Nova Era. Cigar Rollers bring something unique and memorable to your event! 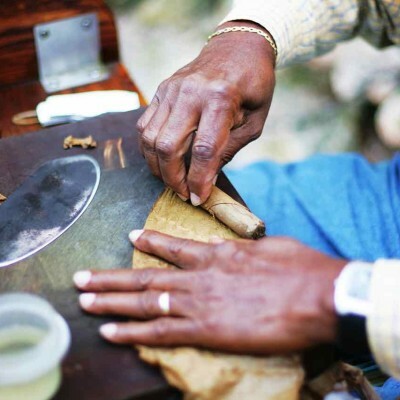 A professional Cigar Roller, a Cuban artisan with years of experience, will entertain your guests as he rolls premium cigars. The cigars are made with Cuban-seeded tobacco. You choose the size and length you want. For that “added touch”, a bilingual host, serving as a translator, accompanies the cigar roller, while helping guest cut and lights the finest tobacco in the world. The Cirikli Stilt Bird is entertainment like you have never seen or experienced before. 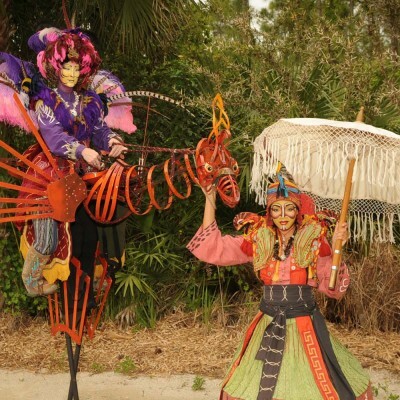 This tall, graceful bird is a fully articulated wooden puppet controlled by skilled stilt performer that appears to be riding it. This spectacular bird or birds have all the color and finery of a supernatural creature, on a grand scale. It’s led by their ever-watching Shepherd, these animated birds interact with their audience – a gentle head tilt, or the graceful movement of a feathery crest or inquisitive beak will take your astound your audience.